"Michael" and "David" are Michael and David Phillips, brothers whose family has farmed fruits and vegetables in the Lodi region since the 1850s, cultivating wine grapes for nearly a century. Michael and David constitute the 5th generation of grape-growers in the Phillips family, with the 6th generation now joining the family business. Farming with future generations in mind, Michael David Winery has adopted some of the most progressive sustainable farming practices in the state. All 750 acres of the family's vineyards are third party certified and the state's first per ton bonus was issued for contracted growers to follow in the family's foot steps. 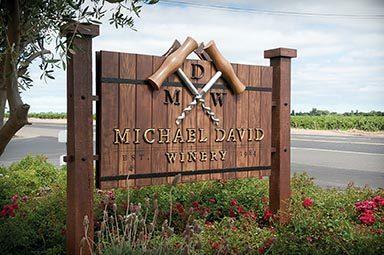 Starting with the 2011 vintage, 100% of the Lodi grown fruit crushed at Michael David winery was certified sustainable. This wine is interlaced with flavors of freshly smashed summer red berries, pepper, earth and spice. Black cherry on the mid-palate, and a bit of graphite on the finish with a touch of vanilla. It shows complex aromas of freshly crushed fruit (blackberry and plum), pepper and tobacco. Velvet-smooth tannins, this elixir fills every corner of the mouth with its decadence.